First Line: If I preserve but one memory at my own death, it shall be the burning of the dog-headed beast. At the age of seven, Oswald de Lacy was sent to a monastery, his life given to the Church. But at the age of seventeen, his father and brothers dead from the Plague, Oswald finds himself Lord of Somerhill Manor. In a world turned on its head by contagion and death, it is a life that he's ill prepared for. He's barely had time to reacquaint himself with his mother and sister when news comes of the death of Alison Starvecrow. The village priest insists that the young woman was killed by a gang of dog-headed demon men. Oswald knows this is utter nonsense, but proving it turns out to be much more difficult than he ever imagines. In Plague Land, S.D. Sykes does an excellent job in showing how the Plague has turned everything on its head-- from political alliances to the attitudes of the poor toward their "masters." The Plague may have burned itself out, but everyone is still reeling in the aftermath. Entire families and villages wiped out. Land lying fallow because there's no one left to farm it. In this time of catastrophic change Sykes places a remarkable cast. Young Oswald has the advantage of his higher learning in the monastery, but his cloistered life also puts him at a disadvantage. He's ill-equipped to get reluctant, superstitious villagers to work the land. He knows extremely little of current alliances with the local gentry. He has a village priest who has his eye on more earthly prizes, and his mother and sister are worse than a thick cloud of midges. If not for the help of Brother Peter, chances are that Oswald would run screaming back to the monastery to beg for sanctuary. Oswald's investigation stumbles and bumbles, much as his management style at Somerhill Manor. But as he awkwardly goes about his business, readers see the rich tapestry of life and relationships in southern England after the scythe of the Plague has swept through. Food, customs, and the usual panoply of human emotions parade right before our eyes. Sykes had me living in the world she created. 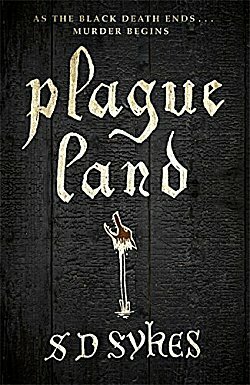 If you like historical mysteries that you can sink into and experience, Plague Land is for you. And if you like books with absorbing mysteries and jaw-dropping endings, then Plague Land is most definitely for you. I look forward to S.D. Sykes' next book. This sounds right up my alley... off to investigate! Oh oh. I haven't read Norman's book. As soon as I post this comment, I'll have to scurry off to take care of that oversight! To Defoe and Willis I would add Geraldine Brooks' Year of Wonders about Eyam-- which is why I visited the village the last time I was in the UK. The Diana Norman is very good on the time period and covers events other than the plague, but does the plague very well. Diana Norman, btw, is Ariana Franklin. Oh yes, I've heard of the Year of Wonders but not got to it. I shall get to that soon. Read another book of hers which I thought was good. I knew about Norman/Franklin. The other book by Brooks that I really enjoyed was People of the Book.